Beginner yoga combined with adorable baby lambs and goats - guaranteed to put a smile on your face and a bounce in your step. Experience a 45 minute class taught by instructors from Simplicity Wellness and Yoga studio. 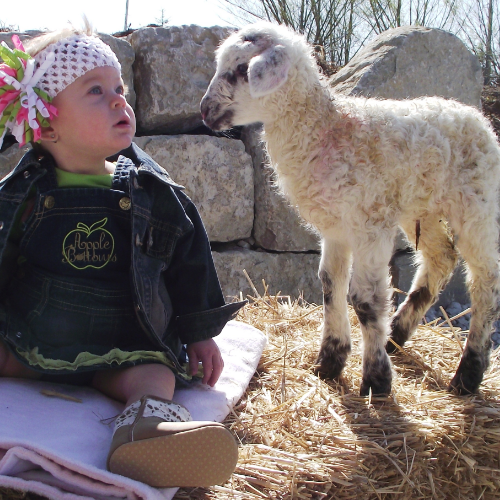 Baby lambs and goats roam among participants during class providing unsurpassed entertainment. A 3 hour cheese making class will teach both fresh chevre and feta for beginners. Experience the stress reducing antics of baby lambs and goats and gain the healthy benefits of yoga taught by a professional instructors. Each yoga class will be held outdoors on the farm with a maximum of 20 participants and a minimum of 5 per class. Please bring your own yoga equipment. This is a working dairy farm with award winning cheese samples available after class. After the yoga class, you will go inside the dairy cheese make room and learn to make cheese. Using Doe's and Diva's Dairy farmstead milk, the class will make fresh chevre and tangy feta. During the class you will learn the differences between sheep, goat and cow milk, proper sanitizing methods, temperatures, timing, cultures and the aging process of your cheese.